Do you want to discover the inner workings and groundbreaking ideas that made just another dot com start-up transform itself into a company worth tens of billions of dollars? This book provides a definitive account of the creation, growth, deals, patents, culture and technology surrounding the best known business success of our time: The Google Story. Published in 2006 and becoming a bestseller in over 20 languages, I purchased the paperback around 2008 out of curiosity while browsing the book section of the Virgin Megastore. Once I started reading I couldn’t put it down. Thoroughly researched by author David A. Visea and told like a thriller, this page turner will appeal to anyone with the even the slightest interest in the popular search engine. Most interesting of all is the elusive brainiac pair behind the tech powerhouse. Sergey Brin and Larry Page began their working relationship after they met at university. Initially they disliked one another. Their verbal jousting led to collaboration and this led to a project that eventually became the early version of the now famous search engine. Like Zuckerberg’s Facebook, it was a dorm room labour of love that underwent expansion before moving to more suitable premises. On a small budget the genius duo rented a house and the adjoined garage while using the Standford University servers. In September 2013 Google commemorated their 15 year anniversary from the garage and property they still own by announcing a new product for their search engine. 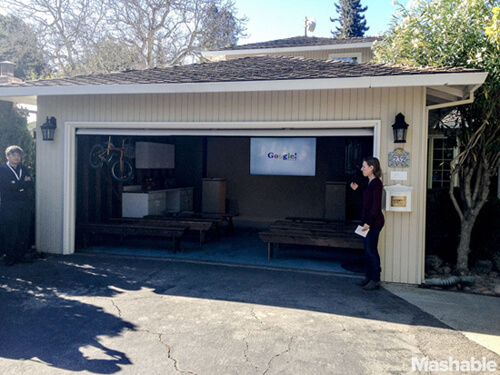 Google’s garage. Some men use a garage to brew beer or play pool… not Sergey and Larry! Originally the company was going to be called “BackRub” but instead used a variation of the word Googol, a mathmatical term describing a large finite number achieved by adding a hundred zeroes to the number 1. The choice to associate the company name with this term reflected the founder’s desire to collate enormous amounts of information from the web and return it to users. The eventual PageRank system was based on inbound links to a website or webpage, to theoretically determine importance. Today the algorithm is still link based but takes over 200 variables into account when ranking pages. As you’ve probably guessed, “PageRank” borrows Larry Page’s surname. 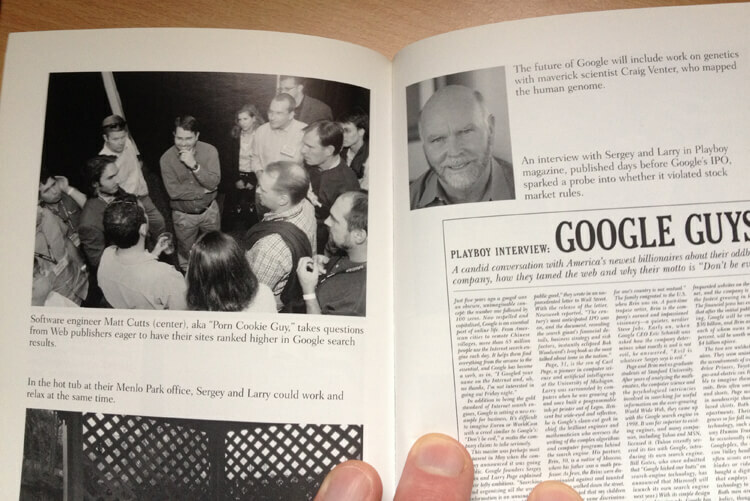 I remember the first time I used Google – It was during an IT class some time around 1999. The pupils used Yahoo or Alta Vista to search online but Google was a novelty, what with its minimalist page and colourful logo. Originally I thought it was a joke. I’d never seen a clean white page like that before. It was unheard of. The search results were great though! Hardware was important to Page and Brin in the beginning and they came to realise their growth depended on capital investment to improve the network Google ran on. The auction based text ads answered the question of how to earn from the increasingly valuable virtual real estate the fledgling search engine had created. The author rightly points out in the early days, when the company was still private, it was inscrutable to all except the inner most circle. 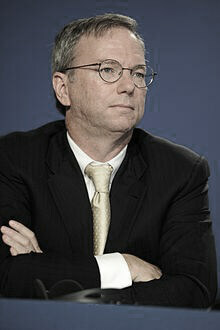 The author paints Google as the maverick up against the dominant Microsoft. The feuding between Google and the EU has been reported in the news lately. And then Germany accused the US of industrial espionage and “spying”. Privacy and data security is a growing Google issue. In August 19th 2004 Google floated at $85 per share. The IPO Raised $2billion and the price later soared to $300 per share, eclipsing the value of Microsoft shares. Google stock had become worth $80 billion, transforming it from a just another tech success story to a force to be reckoned with. As of 12th March 2015 the stock is worth $551 per share. If you’re interested you can check the stock value for goog on Nasdaq. Don’t Be Evil – this is a formal motto established by Google themselves to remind them to set and observe ethical boundaries. The fact this is (or was?) the company motto made me laugh hard. It’s exactly what I would expect someone who IS evil to say. You’d might as well use mottos like “Stick it to the Man!” It smacks of student power at its most naive. Liberal, well meaning… but kind of stupid. The motto was reportedly coined during a meeting by a staff member around the year 2000, possibly before the public flotation and possibly before meddling investor committees had a chance to water things down. There’s a Wikipedia entry about the Don’t Be Evil slogan and has been described as an “albatross” by the director of Berkeley School of Law. The pay per click model has been popularised by Google but did you know the idea was originally invented and patented by GoTo.com? It was later called Overture and after that known as Yahoo Search Marketing PPC. Patent litigation proceedings ensued but the lawsuit was eventually settled out of court. Google copied the auction based text advert service in 2002 and called it Adwords. This is one of the more interesting parts of the book and I’d like to learn more about this. One characteristic Google have held to is their software beta release policy to the general public. Software that is technically flawed is released to early adopters/innovators for testing and upgrades. But it annoys me to regard this as “innovation.” It’s a nuisance dealing with buggy software that is often abandoned after all the razzmatazz surrounding the launch. I have seen this with pretty much every product they’ve released, especially the Google Plus and YouTube integration, which IMO was a mess for about 4 months. “Don’t Be Buggy” – there’s a motto. In the book the author stated Google hoped their involvement in Technology and health will empower millions of individuals. It’s true to say they’ve invested heavily in health as this recent report shows. At the Googleplex the preference is for engineers to work in teams of 3 with 20% of each employee’s time dedicated to pursuing private interests. This idea is borrowed from academic institutes where professors are given one day a week to do whatever they like – as long as they are not idly wasting time. I like this idea of a slightly unstructured working environment where creativity can flourish. It is unusual to find this in any run-of-the-mill office. There’s no doubt it must be fun to work for Google, however, over the coming years companies like Apple and Facebook would begin poaching each others employees. 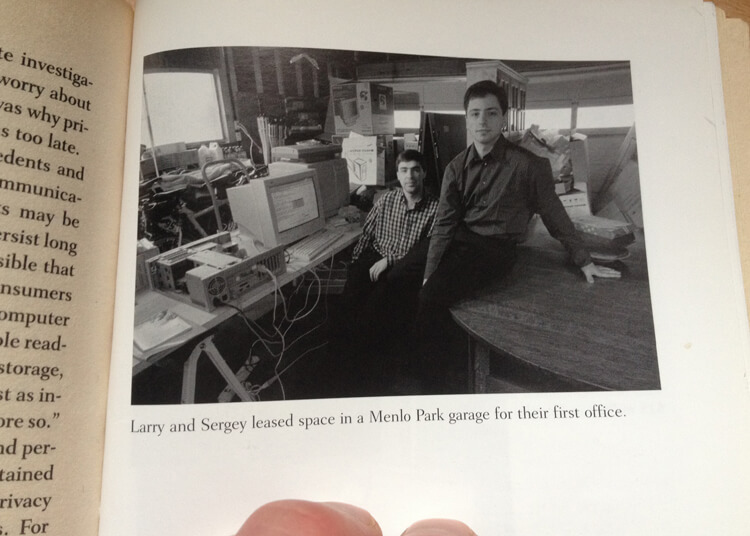 To address the issues of the Google corporate structure and lack of middle management, the hiring of Eric Schmidt was a decision Larry and Sergey knew they needed to make to develop the business. And so Schmidt joined as a director in 2001 and became CEO later that year. Subsequently, he was elected to the board of directors at Apple in 2008 but resigned in 2009 due to his position within Google. He’s one of the few people in the US who became a billionaire based on stock options – yes, he was given nearly 15 million Google shares. His initial $250,000 salary was turned into a $1 annual salary, presumably because his bonuses and/or compensation would be exempt from certain payroll taxes. “Don’t Be Greedy!” – another motto. The testimonial on the front cover is “a gripping book, written like a detective story… expertly told”. This pretty much summarises what I think too. It won’t transform your understanding of SEO. It will not provide any insights into high rankings. It isn’t going to help budding tech entrepreneurs and it won’t teach you how to make a lot of money. Whether you want to buy it depends on how interested you are in technology companies but you need to remember the book was last updated in 2008. If you’re interested in a chronological timeline of Google you can check that out as well. The book shines a favourable light on circumstances while others view the incumbent search engine as having become the heavyweight fighter defending the title instead of challenging it. You can get the book online or at most good book shops. If you don’t want to purchase it, see if your local library has it in stock. The Google Story on Amazon (affiliate link).